Sold per loose cubic metre. 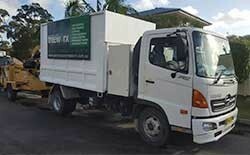 Wood is delivered and tipped at the nearest possible point to your desired spot. Please note for safety purposes we need to tip the truck on as flat level ground as possible, away from over head wires. Lower grade mulch that consists of palm tree mulch, coral tree and camphalaurel tree. In some cases this mulch will be mixed with top quality mulch, ideal for people on larger properties requiring large amounts. Remember, this mulch is free and definitely better than none at all!